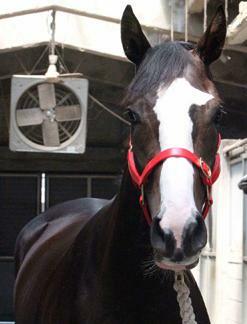 Korean Derby winner Speedy First heads a field of fourteen in the Korean Oaks at Busan Race Park this Sunday. She will be looking to go one better than the last filly to win the Derby, Sangseung Ilro, who was just beaten on the line as she attempted to complete the double in 2009. Four fillies will travel down from Seoul and despite the absence of Joy Lucky, the track’s best performing filly, it looks like there are two credible challengers among them in the shape of Cheonnyeon Dongan and Dewma. Joe Fujii gets the ride on Speedy First while Darryll Holland will be on the dark-horse of the field Raon Bally. If Fujii wins the race, even though he hasn’t matched Toshio Uchida’s total number of race wins, he will surely go down as the most successful foreign jockey in Korea ever. The Korean Oaks is race 2 of a 6-race “twilight card” at Busan. Landed her only win to date over 1500 metres last time out although the company was nothing special and there’s little suggest she’ll find the necessary improvement here. She has two 4th places over this distance at Class 2 level which suggests that she is talented but that despite her name, she tends to always find a couple quicker than her. That will probably be the same here although she has a faster time over the distance than Speedy First. A Class 3 winner last time out and has never finished worse than 4th. Distance is a concern but she’s by no means alone in that regard. Impressive record but her wins have come at 6 furlongs and she found things tough over a mile last time out. Very much a dark horse here, Raon Bally hasn’t run for 6 months and only race-trialed to qualify here last weekend. Before her lay-off, she was tipped to be quite a talent and with Darryll Holland on board, could be very interesting. Was well beaten by fellow Seoul entrants Dewma and Cheonnyeon Dongan in the Sports Seoul Cup over the same distance and despite bouncing back with a win on her return, will have to improve a lot more to overcome that form. She is a half-sister to 2011 Oaks winner Useung Touch. Took her eleven races to graduate from class 6. She’s not stopping anything else from running so there’s no problem with her being here, but she’ll not be in contention. The Korean Derby winner and the obvious favourite. In her only appearance since the Derby, she was interfered with just after the start and unseated her jockey. There will be many who believe that’s the only way she’ll lose here. However, they said the same about Sangseung Ilro, who was pipped on the line in 2009. Nevertheless, a worthy favourite and very hard to beat. One of few fillies in the race with a proven record over 1800 metres. Cho Kyoung Ho coming down to ride her is a big point in her favour too as Cho is not the kind of man to travel to Busan for the nightlife. A contender. No ride of Jo Sung Gon’s in a big Stakes race can ever be discounted and this one is no exception. She was a well-beaten 5th behind the very promising colt Magic Dancer last time, but has every chance of competing for at least a place here. Her name might be Winning Steak but she’s certainly not on one as she’s not won since March. She won’t win this either. Has a win over 1500 metres but that was at class 4 and she’s shown little to suggest that she will be able to compete with some her of her rivals here. A chance. Second only to Joy Lucky in her last three starts (a filly who would have rivalled Speedy First for favourite had she been entered here) albeit by substantial margins. Korea’s first female trainer Lee Shin Young has a fighting chance of saddling an Oaks winner. Joy Lucky put herself among the leading contenders for the Korean Oaks with a commanding win in the Sports Seoul Cup at Seoul Race Park this afternoon. The promising filly was sent off as second favourite for what is Seoul’s premier Oaks trial race and having taken an early lead. she was never troubled as she stretched away for a 9-length victory. Favourite Dewma straggled home in 2nd place with Cheonnyeon Dongan in 3rd. However, the race was all about Joy Lucky whose only defeat to date was in the Korean Derby last month. Of course, the Derby winner, Speedy First is a filly and so long as she stays sound, is likely to be prohibitive favourite for the Oaks, which will be run at her home track of Busan in August. Joy Lucky will need to show even more improvement to overturn the Derby result. * Seo Seung Un is the man this year’s new jockeys will be looking to emulate and Lee Chan Ho today became the first of their number to ride a winner. Lee, who debuted last week, guided filly Last Love (Volponi) to victory in race 6. It was another good day for the Japanese contingent. Ikuyasu Kurakane rode another double with victories in races 1 and 5 while Yukio Abe was also among the winners. 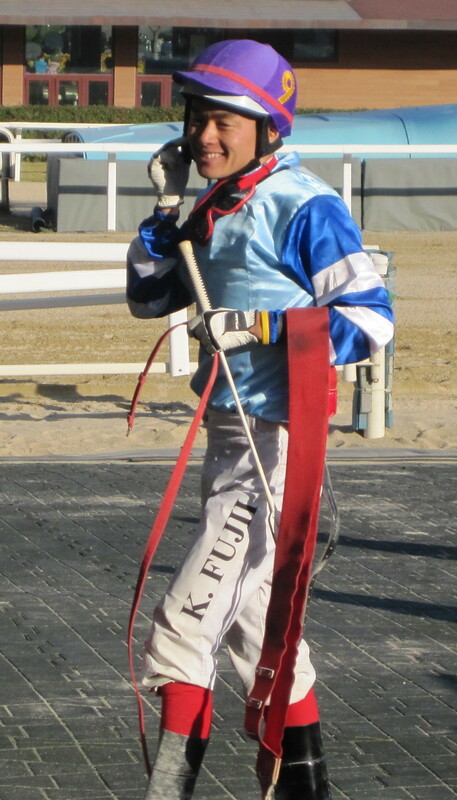 Down at Busan, Joe Fujii also scored his now regulation winner. Next week it is Seoul vs Busan in a new race on the calendar, the Jeju Governor’s Cup. A big prize is on offer as Seoul’s top horse Jigeum I Sungan (Ingrandire) faces a formidable foursome from Busan that at this stage comprises Stakes winners Useung Touch, Yeongdusong, Gyeongbudaero and prolific winner Road To Prince. The Korean Derby, which will be run at Seoul Race Park this coming Sunday is a relatively recent addition to the Korean racing year. Except for an enforced stoppage during the Korean War, racing has been running on the peninsula continuously since the 1920’s but while those early years saw horses racing each other, it wasn’t exactly the kind of horseracing we’re familiar with today. Many horses weren’t even thoroughbred and there was little point in having a Derby for three-year olds. The establishment of a domestic thoroughbred breeding industry and the introduction of the private ownership of race-horses – and therefore prize money – changed all of that. The late 1980’s and early 1990s saw the creation of big Stakes races and, with the breeding industry reaching some maturity, finally in 1998, the Derby was run for the first time. In 2007, the Korean Triple Crown Series was inaugurated with the Ttukseom Cup, Derby and Minister’s Cup making up the three Classic races. Indeed, in that first year, J.S. Hold took the lot. The following year, as the first set of foals sent to Busan after the track’s opening in 2005 reached maturity, the KRA Cup Mile at the Southern track was re-designated as the “Korean Guineas” and replaced the Ttukseom Cup as the first jewel in the crown. The filly Sangseung Ilro won the first two legs in 2009 and Jigeum I Sungan won the Derby and Minister’s Cup last year, but no horse has yet won all three under the new set-up. In the fifteen editions of the Derby run so far, nine colts and five fillies have taken the prize which for its first three years was run over just seven furlongs before moving up to its current nine in 2001. When the first crop of foals to be sent to race exclusively at Busan reached three-years of age in 2008, the Derby – and other major Stakes races – became open to horses from both Seoul and Busan. Since then, raiders from the South have won three out of five times and in KRA Cup Mile winner Sting Ray, have the favourite for this year’s edition. 2012: Jigeum I Sungan [Ingrandire – Solmaru (Mujaazif)] – Moon Se Young – A horse who as just got better and better since winning the Derby at generous odds a year ago. He went on to win the Minister’s Cup, the final leg of the Trip Crown in October before coming back as a 4-year old to win the Owners’ Cup last month. 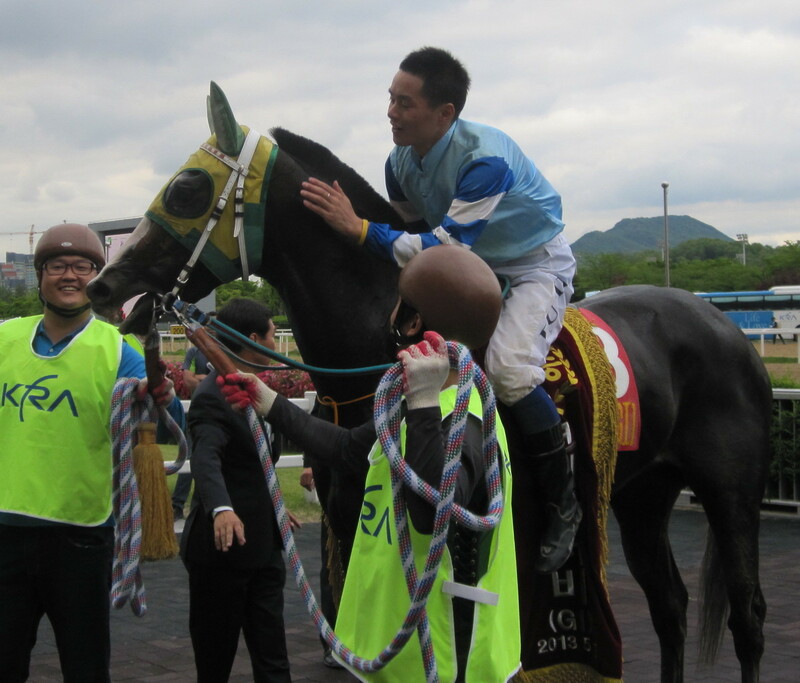 2011: Gwangyajeil [Vicar – Hurricane Havoc (Jade Robbery)] – Oh Kyoung Hoan – He skipped the KRA Cup Mile and went straight to the Derby. It paid off as he was an easy winner. Injury meant he only ran twice more and was retired to Stud at the end of his three-year old season. Bred by the late Im Sang Yun, who also bred J.S. Hold. 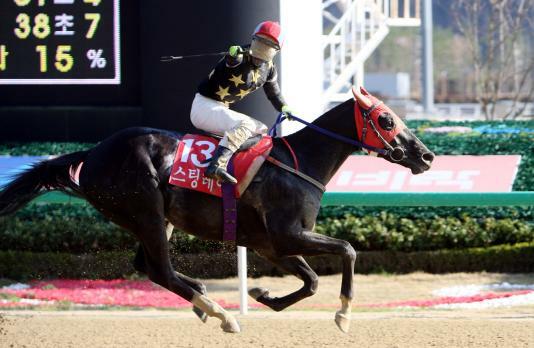 2010: Cheonnyeon Daero [Creek Cat – Doneitmyway (Northern Flagship)] – Park Geum Man – Money Car, winner of the KRA Cup Mile was sent off the favourite but got sucked into a speed duel with the sprinter Seonbongbulpae in the early stages. Still, the favourite had a considerable lead entering the final furlong. 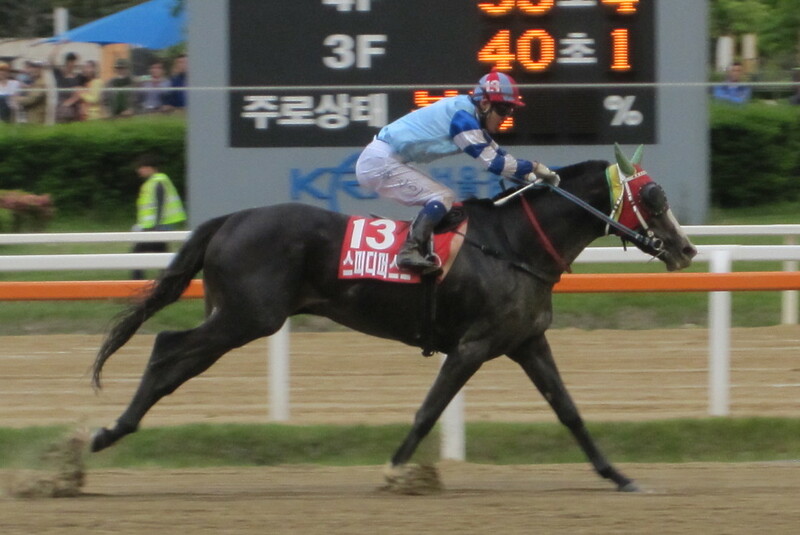 He was spent though, and Cheonnyeon Daero, a 30/1 shot, chased him down and caught him on the line. Money Car was never the same again and only ran once more. Cheonnyeon Daero went on to finish second in the Minister’s Cup – the final leg of the Triple Crown. A horse with a bad case of seond-itis – he finished 2nd 14 times during his career, he was retired in early 2012 and will go to Stud. – The filly, a shock winner of the KRA Cup Mile a month earlier made it two in a row for Busan. She couldn’t maintain her form over the whole year, however, and went down to a shock defeat in the Oaks in August before returning for a creditable third in the Minister’s Cup, the third and final leg of the Triple Crown in October. Went on to win two more Stakes races as a four-year old before being retired from racing in January 2011 for broodmare duties. 2008: Ebony Storm [Buster’s Daydream – Sorority Jazz (Dixieland Band)] – Shim Seung Tae – Two years ago was the first time that Busan’s best three-year olds were invited up to Seoul to contest the Derby and it was one of those visitors, Ebony Storm, the longest shot on the board, who took victory in a monsoon downpour. Ebony Storm is still running as an 8-year old, specialising in distances of up to a mile and his half-brother Fantastic Jazz is among this year’s hopefuls. 2007: J.S. Hold [Ft. Stockton – Hwangsangjiljoo (Passetreul)] – Moon Jung Kyun – Widely considered the best Korean bred horse ever. J.S. Hold landed the inaugural Triple Crown injuring himself in the final race and not returning to the track. He retired with nine wins from ten starts and is now at Stud. 2006: Baengnokjeong [Slew O’Green – Lesu Run (Proper Reality)] – Hwang Soon Do – The rank outsider at over 80-1 on Derby day, Baengnokjeong was at the time, the longest priced horse to win the Derby. 2005: Saebyeok Dongja [Fiercely – Cheongpa (The Rodgers Four)] – Chun Chang Ki – Raced on at the top-level for three more years. 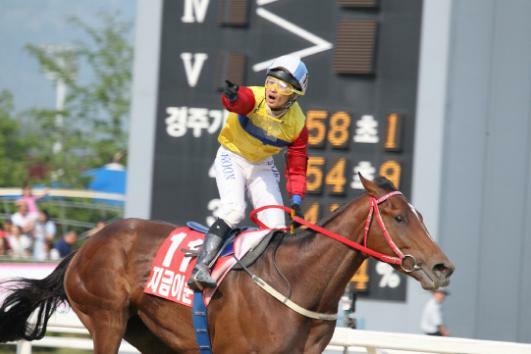 His jockey, Chun Chang Ki became a trainer and sadly passed away of cancer in 2012. 2004: Mupae Gangja [Didyme – A Heun A Hop Kan (Kinsky)] – Kim Hyo Seob – One of the top colts of this decade, Mupae Gangja won ten of his sixteen races including the Chairman’s Trophy and Minister’s Cup along with the Derby in 2004. 2003: Habidongju [Silent Warrior – Kahwa (Zoffany)] – Park Tae Jong – The last filly to win until Sangseung Ilro in 2009. 2002: Haeam Janggun [Didyme – Ronde (Toast The Champ)] – Lim Dae Gyu – Ronde foaled her second Derby winner in as many years with this filly who won eight of her fourteen races and gave the late Lim Dae Gyu a Derby victory. 2001: Haetpit Maeul [Mujaazif – Ronde (Toast The Champ)] – Ji Ha Ju – Starting a run of three consecutive years of filly triumphs was Haetpit Maeul. Now a broodmare with some success. 2000: Haekdol’pung [Lost Mountain – Swift Diplomacy (Nice Pirate)] – Park Tae Jong – Korea’s most successful ever jockey got his second straight Derby win on the favourite. It was tight though, with Haekdol’pung getting the verdict in a three-way photograph. Sire Lost Mountain died in 2009. 1999: Manseokkkeun [Fiercely – Komplication (Kris. S)] – Park Tae Jong – Yes, he really did have three consecutive ‘k’s in his name. Park Tae Jong got the first of his three Derby winners on the colt whose sire, Fiercely, died in 2009. 1998: Useung Yegam [Happy Jazz Band – Man Jang Dae()] – Song Seok Hen – Nine of the 14 runners in the first Derby were fillies and the favourite Useung Yegam, whose dam wasn’t even in the studbook, took the honours by a length. * This post is a slightly updated version of the one posted in corresponding Derby build-ups over the past couple of years. Sting Ray, the odds-on favourite, swept to a convincing victory in the KRA Cup Mile at Busan Race Park this afternoon. The race, known informally as the Korean 2000 Guineas, was the first leg of the 2013 Korean Triple Crown. Sting Ray (Forest Camp), who came into the race off the back of 2 consecutive impressive wins was always travelling well under Kim Dong Young as Harley (Menifee) set the early pace. As they entered the home straight and spread across the track, Sting Ray hit the front and never looked like being caught as he stretched away for a 4-length win. Raon Boss (Pico Central) showed that his last outing, where he finished 13 of 14 was an aberration by finishing a strong second, giving British jockey Darryll Holland a great result in his first Korean Classic race. The Peter Wolsley trained Fantastic Jazz (Menifee) was a close 3rd. Wolsley’s other-runner, the slightly better fancied Amell’s Atom (Menifee) finished 4th. Sting Ray is a half-brother of 2012 Korean Oaks winner Rising Glory, through their dam Straight Cash. Straight Cash herself was a top class filly who ran in Korea and won the 2005 JRA Trophy race. With 2 Classic winners, she has already established herself as among the top broodmares too. The result was another disappointment for Seoul based trainers as Busan-trained horses dominated the placings. Rapide Bullet (Revere), back in 5th, was the best placed finisher from the capital. It’s difficult to see how this is going to be reversed when the country’s top three-year olds reconvene in Seoul on May 19th for the Korean Derby. Sting Ray has already won at 1900 metres – further than the Derby distance and looks like he’s only going to get better. Also Ran: 4. Amell’s Atom 5. Rapide Bullet 6. Rising joy 7. like The Sun 8. Last Mudae 9. Yapung 10. Heungnyeong Bisang 11. Cheonneyon Dongan 12. Global Gangja 13. Harley 14. Ruby Canter.